NEPEAN, ONTARIO, CANADA - Eurocom Corporation has launched the world's first Pentium 4 notebook PCs based on Intel's most advanced x86 microprocessor. With their superb performance and features, the EUROCOM 8170 Monte Cristo and EUROCOM 5600 Monte Carlo truly live up to Eurocom standards of 'desktop replacement,' with capabilities equal to a high-end desktop system but in a light and trim portable device. Running the Intel® Pentium® 4 processor at speeds up to 2.2 GHz, the EUROCOM 8170 and 5600 models provide an unparalleled performance for notebook computers. This powerful processor combined with the two models' video subsystem, based on the ATI Mobility Radeon video chipset and plenty of DDR video memory brings workstation-level 3D graphics for incredible online gaming or responsive handling of demanding modeling applications. For comfortable viewing, the EUROCOM 8170 Monte Cristo supports 14.1" TFT LCD, available in XGA 1024-by-768 pixel resolution, and SXGA+ resolution of 1400-by-1050. With its high-resolution, the EUROCOM 8170 not only provides a great viewing experience for games, Web browsing, and multimedia playback, but also comfortable handling of large or finely detailed documents and images. In addition, the EUROCOM Monte Cristo offers a number of other outstanding features. For example, the new portable's system memory utilizes high-perfor- mance SDRAM, up to 1GB, driven by 133 MHz memory bus, and boasts a 400 MHz front side bus, allowing it to smoothly multitask a large number of the most memory-hungry applications without performance degradation or system instability. For connecting external devices, the EUROCOM 8170 not only provides standard ports such as USB port, VGA port and a 32-bit CardBus-compliant PC Cardslot, but also a IEEE 1394 port for connecting high-bandwidth items such as video cam- corders, an S-video TV-out port, and even a parallel port for connecting legacy peripherals. Wireless connectivity is also supported through an IEEE 802.11b wireless LAN PC Card solution. A professional user will find a perfect computing solution in the all-in-one EUROCOM 5600 Monte Carlo notebook. The system offers the absolute latest in computing technology sporting a 15-inch SXGA+ (1400x1050) or UXGA (1600x1200) active display, the Intel® Pentium® 4 processor up to 2.2 GHz (400 MHz Front Side Bus), 64 MB of DDR video memory and up to 1 GB of 266 MHz SDRAM. 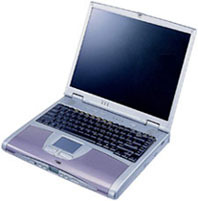 The ATI Mobility Radeon 7500 chip, Integrated AGP 4x, Integrated 128-bit 2D/3D Graphics Accelerator and the Fully DirectX 8 Compliant Graphics engine ensure powerful graphics and brilliant display, while two CD- ROM bays hold optical drives of your choice: CD-ROM, DVD, CD-RW or DVD/CD-RW combo drive allowing for a fast CD copying. The 5600 model comes with a CD Player function, four USB ports, 1394 IEEE FireWire, one S-Video jack for TV Output and built-in 802.11b wireless LAN. Over two hours of battery life with the primary battery, a secondary battery and beautiful design with customizable palm rest colors make this machine the most desirable notebook. Moreover, the two notebook models include five built-in Easy Start Buttons and one button for instant retrieval of new email received. By simplifying common tasks, these extra buttons help users to save time and increase productivity. The keyboards are ergonomic to ensure user's comfort and efficient usage of the notebooks even over long periods of keyboarding sessions. For users who desire a portable powerful computer, but don't want to do without the leading-edge power of a Pentium 4 processor, advanced 3D graphics, and roomy display, the EUROCOM new notebooks are truly a dream come true.